Is it true that Jio users consume as much data as United States and 50 % more than China? 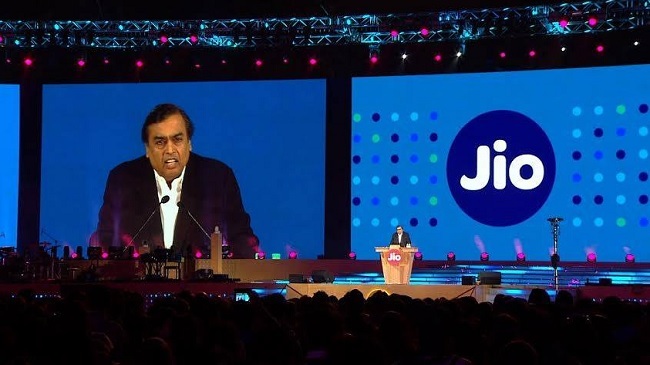 Yes, if RIL Chairman Mukesh Ambani is to be believed based on the speech delivered on the 170th day of the launch of Jio after having ‘crossed the 100 million customer mark’. He of course is the most credible source of information on how much data has been used by Jio customers and thus, the mobile data usage of 100 crore GB (1000 Petabytes) in the month of January offers less scope for fact checking. However, here we look into if Jio users have indeed surpassed American and Chinese mobile data usage. CISCO on February 9th, 2017 released the Global Visual Networking Index forecast. Following are the forecast for the three countries. Note: 1 PB is (10 raised to the power of 15) bytes. Note: Forecast for 2017 has been calculated using compounded annual growth rates (CAGR) of growth in mobile data traffic provided by CISCO for the countries. CAGR for US, China and India are 42, 64 and 63 per cent, respectively. According to Mr Ambani, Jio users have consumed 100 crore GB in January, which is equivalent to 1000 PB. If so, Jio users have consumed more than 50% and 60 % of the mobile data usage of US and China, respectively, in 2015 (Actual data is available only till 2015, the rest is forecast). Thus, if 2015 is the benchmark, what Mr. Ambani said is true, even though the time periods are not strictly comparable. Boom had approached Reliance Industries Limited for clarification on the comparative data. But, RIL is yet to respond on the same. A deeper analysis of Mr. Ambani’s statement requires bringing in 2 more factors into the picture. A 2 year lapse in data – The absence of real data post 2015 is at his rescue. If we look into the forecasts by CISCO for 2017, without any major market disruptions, mobile data traffic of US and China are predicted to be 1016 PB and 1035 PB, respectively. If so, Jio users may not have necessarily used as much mobile data as US and 50% more than China. Paid vs. Free data – The most important point is that Jio users have been paying Rs 0 for mobile data while their counterparts have been paying for it. Free data means more consumption. Thus, if price is indeed a major driving force in the market, the comparison that Mr Ambani brought in shall be fair only after Jio’s freebie period. But all said and done, it is noteworthy that Jio has enabled India to bridge the huge gap in mobile data usage between countries like US and China. Moreover, with the launch of Jio, India has moved ahead at lightning speed and gone beyond the 2017 forecast (396 PB) for the country to more than 1000 PB. However, the catch is will Jio customers stick with the company once the free data period is over on March 31? The wait will not be too long.